We have some new releases out at Kustom9 and Shiny Shabby! Kustom9 is celebrating its anniversary and our contribution is long hair with detachable buns. Buns attaches independently so you can play with it adding them to your favorite hairstyle and make something different! Since it’s an anniversary we are also offering a gift, four skully bows (two in black and two in white) to match your spooky outfit for Halloween. Preview is on the pack! We have a new undercut at Shiny Shabby! It’s offered in our special line ‘Frizzy Chic’ and comes with a new hairbase, specifically drawn for this hair. Please note, system version and #TMP one are slightly different and must be worn properly in order to achieve a perfect fit. – 2 system hairbases (dark and tintable) + #TMP applier with 7 Hairbases tints. Also something for your hands! Simple ringset with hands tattoo for ladies and gents. Presets for male and female hands offered but rings are mod individually in order to fit different hand sizes. Tattoo appliers cover #TMP (unisex), Maitreya and Slink (unisex). System tattoo layer inside the pack as well. Thank you for your support and have an awesome week end! Ready for some newness available at Kustom9? 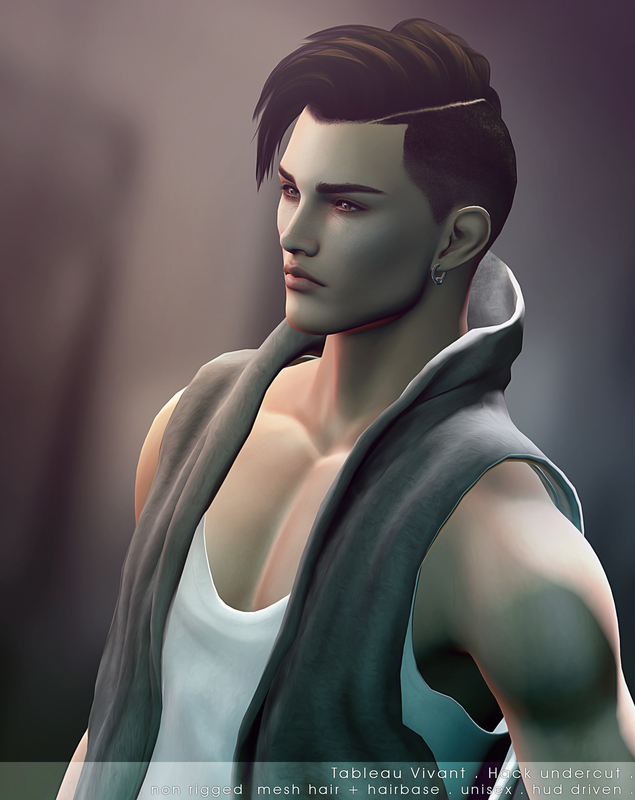 Our release for Kustom9 is a breezy, rigged mesh hairstyle. Leste takes its name from a hot, dry, easterly wind of the Madeira and Canary Islands, perfect for your beach days! We are doing our best to fit mesh heads, please demo our hair wearing your mesh head before any purchase! If you have any problems with delivery – please check our redelivery terminal at our mainstore! We hope you enjoy our latest release and thank you for all your support.